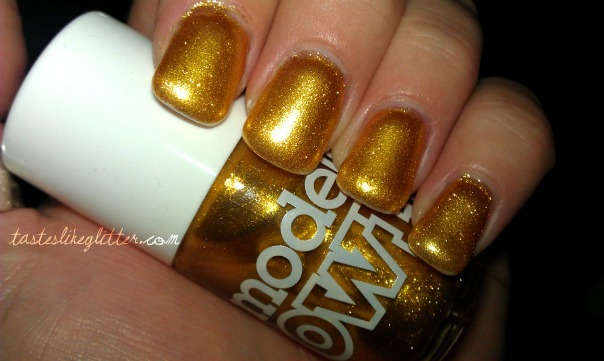 For a long time now, I've been lemming after a really rich yellow gold foil-y polish - namely Orly's Glitz & Glamour. I have seen many photos of it floating about Tumblr but hadn't found anything that was just what I wanted. Until I was browsing the Boots stand a while back. I went into town last week and finally picked it up, I knew exactly which one I wanted. I can't stop staring my nails. Isn't it wonderful? It's everything I wanted. I had to use 3 coats to achieve (mostly) full opacity. Totally my fault, I was painting with the curtains closed. It's quite a thin formula and I usually despise doing 3 coats but for this I shall forgive it. From a distance it looks like a Minx type foil. It is truly amazing. And the tiny glitter particles, evident on my pinky, really lift the polish. For £5 you honestly can't go wrong. This is my first experience with Models Own and it fulfilled my expectetions and so much more. It definitely won't be my last purchase.